Monday is trade deadline day in the NHL. Or, as hockey fans call it: THE GREATEST DAY IN THE ENTIRE WORLD. And with good reason. NHL trade deadline day is truly one of the most anticipated, ridiculously overhyped, and just downright fun days on the entire sports calendar. If you’re a hockey fan, of course, you already knew that. If you’re not, and you’re wondering what all the fuss is about, here are a half-dozen important things you need to know about NHL trade deadline day. Look, the NHL isn’t exactly the world’s best-run league, and that’s probably being kind. But there are four things the league indisputably does better than anyone else: post-playoff series handshakes; having the commissioner give the championship trophy to the players instead of to the suits; having a championship trophy that’s bigger than the actual commissioner; and trade deadline day. Just look at what it has: a firm deadline, lots of trades involving virtually every team, and (usually) a few big names thrown into the mix. It’s perfect. Canadian sports networks cover the NHL trade deadline the way American networks cover presidential elections, only with more objectivity and less restraint. There are the panelists, breaking news updates, flashy graphics that make whooshing noises, more panelists sitting directly behind the first row of panelists, ringing cell phones, hastily arranged live interviews, and even more panelists who have to sit off in a different room for reasons nobody fully understands. We haven’t broken out the holograms yet, but there’s a solid chance it happens this year. The coverage lasts from early in the morning until hours after the deadline has passed, after which everyone involved collapses from exhaustion and is cleared out of the studio by a Zamboni with a plow on the front. Then the recap shows starts. Then the recaps of the recap shows. The TV broadcasts are supported by blanket coverage on the radio, entire web platforms are built for one day, and newspapers devote pages to in-depth previews. If you see anything that looks like smoke signals floating over the Canadian landscape on Monday, you can assume that the Canucks have added a new sixth defenseman. What I’m trying to say is this: If the United States invades Canada on Monday, the average Canadian won’t hear anything about it until Wednesday afternoon at the earliest. There was a time when the trade deadline meant a steady stream of actual blockbusters, usually at ridiculously inflated prices. Teams would frantically try to outbid each other for the available stars, and the sense of tension as the clock ticked down was palpable. But in recent years, there have been fewer blockbusters, or at least those of the flat-out panic variety. That’s partly because the salary cap has made trades involving big-name players more difficult, and partly because some teams have finally realized that desperately trying to pull together complex deals in the hours and minutes leading up to the deadline is a recipe for disaster. The bottom line is that many of the big deals that do get done (such as Jeff Carter to the Kings) end up happening in the days and weeks leading up to the deadline instead. That makes the day less fun for fans, and much less fun for TV hosts who have to fill hours of coverage speculating about depth players instead. And yes, like everything else that annoys hockey fans, this is somehow all Gary Bettman’s fault. The NHL’s current age of parity means that even obviously terrible teams have still convinced themselves they have a shot at the postseason. Heading into last weekend, only two teams in the entire league were more than eight points out of a playoff spot: the Blue Jackets, because their season has been a disaster, and the Oilers, because they are the Oilers. Is it possible to make up an eight-point deficit at this point in the season? No, actually, it’s almost always not possible. Not when you have several teams to get past, and the magical NHL standings fairies keep sprinkling extra points over random games. But teams don’t want to say that, because it sounds like they’re giving up. So they stand pat, miss the playoffs anyway, and then wonder why they never get better. That kind of thinking usually leaves only about a half dozen teams that are actually willing to trade their best players. And those teams are also the worst ones in the league, so they don’t really have much in the way of star power. 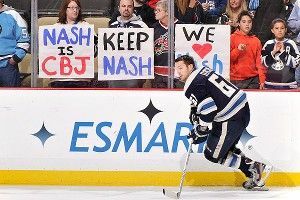 That should mean that an obvious seller like the Blue Jackets can get a boatload for Rick Nash, but at this point nobody really trusts Columbus GM Scott Howson to negotiate into the right end of the telephone, so all bets are off. Add it all up, and you can see why a decent player like Dustin Brown unexpectedly hitting the market suddenly leads to teams lining up around the block for a chance to make a bid. Of course, the Kings later claimed they’d changed their minds and weren’t going to move Brown after all. Again: Gary Bettman’s fault. Only one team wins the Stanley Cup every year! Seriously! Did you know that? The Stanley Cup is only ever awarded to one team in any given season. It’s true! You can totally look it up. And if you didn’t know that, don’t worry, because every NHL GM who fails to land a big-name player at the deadline will tell you about it, incessantly, for the next two months. It’s become the go-to excuse for failing to pull the trigger on a big deal. Mumbling “but only one team wins the Cup every year” into a bank of microphones on trade deadline evening would be the NHL GM’s equivalent of the walk of shame, except that “walk of shame” at least implies that you actually accomplished something. In order to be official, a trade needs to be confirmed by the league in a conference call. Because there are so many trades on deadline day, it can often lead to backlog that can take an hour or two to clear. This means two things: Trades can still trickle in after the 3 p.m. EST deadline, and you will be reminded of this fact constantly. Enjoy deadline day, everyone. And if you Americans do end up deciding to invade, just make yourselves comfortable and we’ll try to get back to you before the playoffs start. Sean McIndoe will be tweeting trade deadline day as part of TSN’s #TradeCentre coverage.